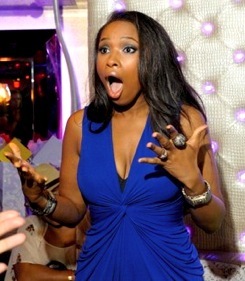 "Jennifer Hudson celebrating her 30th birthday at Opera Ultra Lounge Monday night. The newly-svelte singer, in town for the Kennedy Center concert honoring Aretha Franklin, thought she was going to a late birthday dinner with friends; instead her sisters and about 300 fans surprised Hudson with a party at the new downtown club. The festivities — with a three-tiered cake, 'Happy Birthday' sung by Raheem DeVaughn and Lil’Mo, and Hudson’s hits performed by drag queens — lasted until 2 a.m." [Source] Watch a performance by Jennifer Hudson after the jump.